Why we opted for electric water heating over a solar water heater. Our GeoSpring heat-pump water heater. As we build more energy-efficient houses, particularly when we go to extremes with insulation and air tightness, as with Passive House projects, water heating becomes a larger and larger share of overall energy consumption (see Solar Thermal Hot Water, Heating, and Cooling). In fact, with some of these ultra-efficient homes, annual energy use for water heating now exceeds that for space heating—even in cold climates. If we had built our new house three or four years ago, I suspect that solar water heating would have been included—or at least very seriously considered. But as costs of solar-electric (photovoltaic or PV) systems have dropped in recent years, more and more energy experts are recommending electric water heating, rather than solar thermal, and using PV modules to generate the electricity—so it’s still solar water heating, but not as direct. 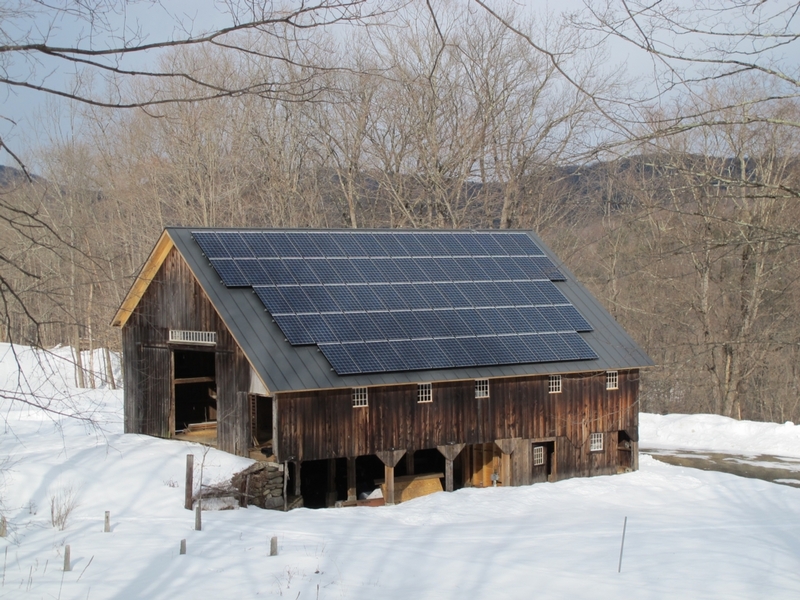 Late-afternoon photo of the PV system on our barn--which is about 100 feet from the house. Tankless water heater. A tankless, sometimes called on-demand or instantaneous, water heater heats the water as it is used. This offers the advantage of eliminating the stand-by loss that occurs with storage water heaters. Whole-house tankless water heaters are most commonly gas-fired, but electric models are also available. The problem with the latter is that they require a huge amounts of electricity. An electric tankless water heater large enough to supply a shower and another use at the same time will require a 60-amp or larger circuit at 220 volts. If a lot of homeowners were to switch to whole-house electric tankless water heaters, it would put a huge burden on the utility companies that have to meet peak demand—particularly in the morning when a lot of people are showering. There are other issues with tankless water heaters, including that they don't necessarily save energy. A heat pump water heater extracts heat out of the air where the water heater is located (typically a basement) to heat the water. Because the electricity is used to move heat from one place to another instead of converting that electricity directly into heat (as with electric-resistance water heating), the energy yield per unit of electricity input is much greater. We measure that efficiency as the “coefficient of performance” or COP—a COP of 1.0 is, in essence, 100% efficient at converting electricity at your site into heat. Most heat-pump water heaters have COPs of 2 to 3, meaning that for every unit of energy consumed (as electricity), at least two units of energy (as heat) are generated. It's a little hard to read in this photo, but I love having the user instructions right on the water heater. 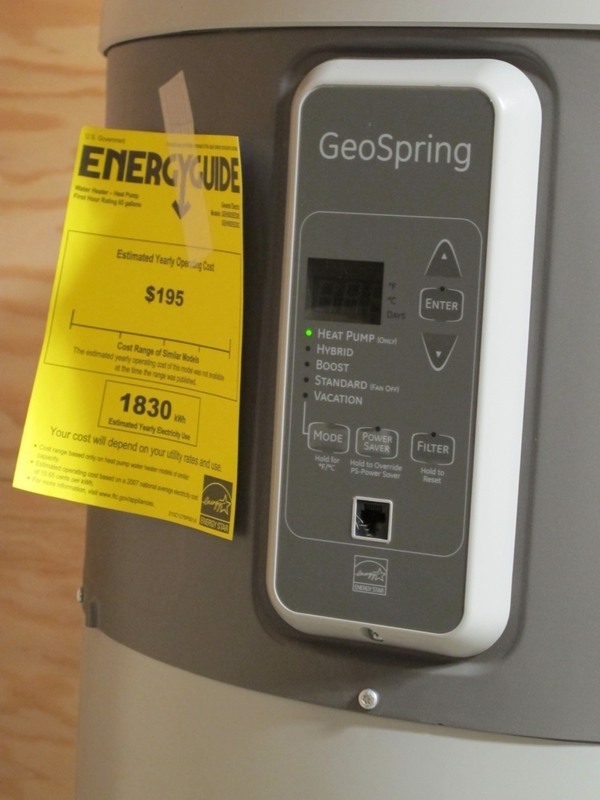 The GeoSpring offers several different control options: heat pump only, hybrid (both heat pump and electric resistance — less savings than heat pump only), boost (faster water heating and less savings than hybrid), standard (electric-resistance only — no energy savings), and vacation (maximum savings when homeowners are away). A heat-pump water heater is what we decided on for our house. 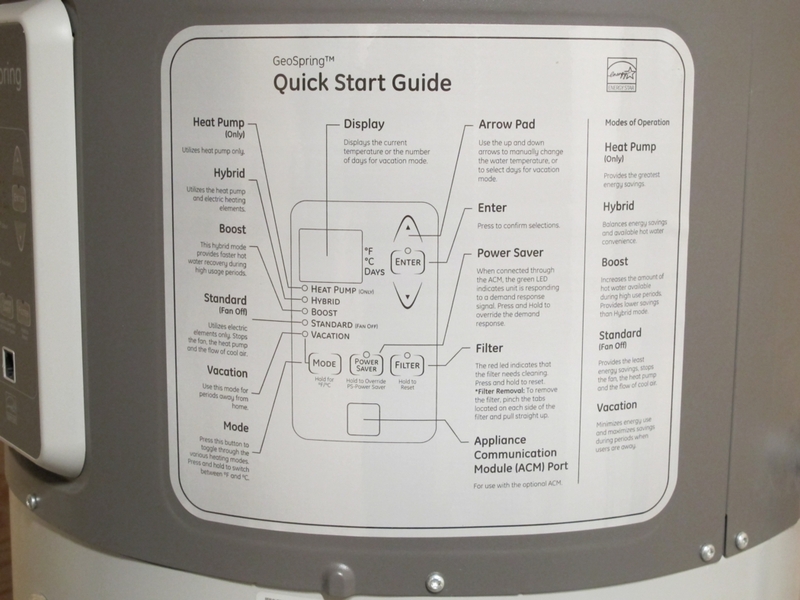 We installed a 50-gallon GE GeoSpring model and, so far, we’re very happy with it. The GeoSpring is currently available only in a 50-gallon size, though rumors suggest that a larger, 80-gallon, model could be introduced. Because water heaters operating in heat pump mode take a long time to heat water, larger tanks typically make sense. If our two daughters were still in the house, a larger heat-pump water heater would have been more important. Next week, I’ll say a little more about heat-pump water heaters, including some issues with placement and implications of the fact that heat pump water heaters cool off the space where they are located—depending on the season, that can be an advantage or disadvantage. 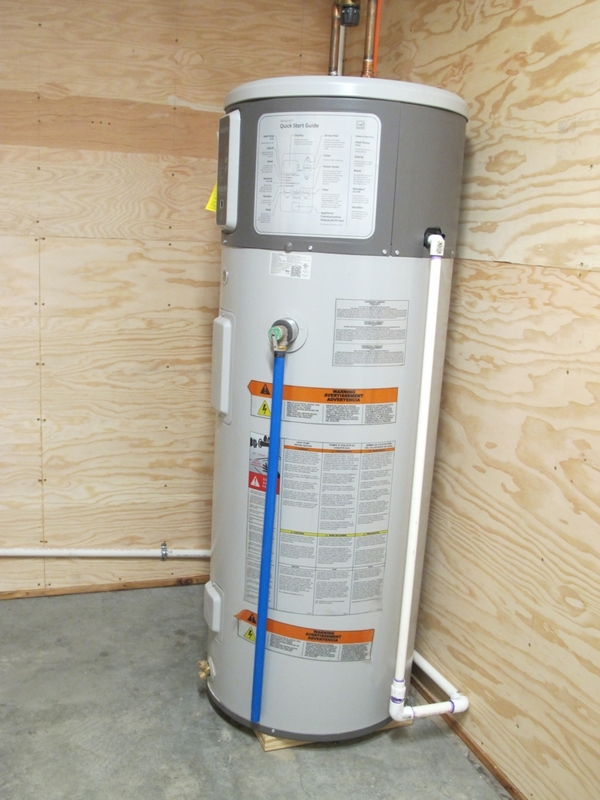 Understanding heat-pump water heaters is important, as they will soon become the standard at least for larger electric water heaters—based on efficiency standards that take effect in mid-April 2015. You simplified PV to much. Inverters and panels can stop working so there is maintenance. Also you lose a lot of those electrons moving though inverters and from roof or barn into the house, especially on smaller wires. The true measure of a PV should be how much energy is available at a point of use in vs. generated by the panels? A well designed Solar thermal hot water heating system a little maintenance. Glycol protects the system from freezing and steam-back (a larger expansion tank) protects the system from blowouts during a power outage . If the internet is available, a solar thermal system can be monitored and adjusted. An evacuated heat tube converts about 93% of the sun's energy into heat. A typical solar hot water heating system with has a COP of over 40 and covers about 60 sq ft. That compares to average COP of 1.9 for heat pump water heaters in a recent study. Heat pump water heaters work better in heated spaces. That makes a basement colder adding to space heating costs in winter and potential basement moisture issues and dehumidifying costs in the summer. Overall, heat pump water heaters do not make energy sense.